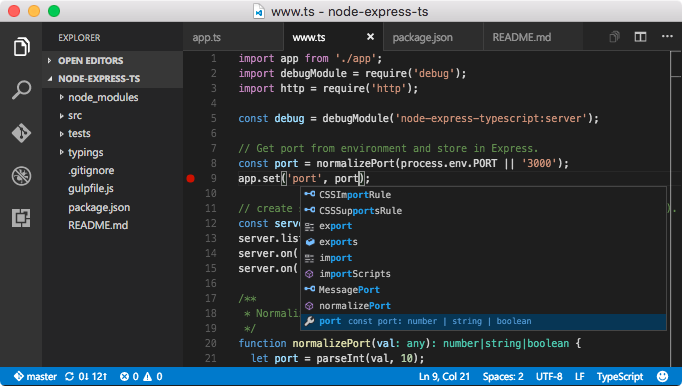 VS Code is a type of tool that combines the simplicity of a code editor with what developers need for their core edit-build-debug cycle. It provides comprehensive editing and debugging support, an extensibility model, and lightweight integration with existing tools. VS Code is updated monthly with new features and bug fixes. You can download it for Windows, macOS, and Linux on VS Code's website. To get the latest releases every day, you can install the Insiders version of VS Code. This builds from the master branch and is updated daily at the very least. Please also see our Code of Conduct. Request a new feature on GitHub. Vote for Popular Feature Requests. Tweet us with any other feedback. Many of the core components and extensions to Code live in their own repositories on GitHub. For example, the node debug adapter and the mono debug adapter have their own repositories. For a complete list, please visit the Related Projects page on our wiki. Code ships with a set of extensions. These extensions are located in the extensions folder. These extensions include grammars and snippets for several languages. Extensions that provide rich language support (code completion, go to definition) for a language have the suffix 'language-features'. For example, the 'json' extension provides coloring for JSON and the 'json-language-features' provides rich language support for JSON.